Def Leppard have been announced for the Stampede Roundup 2013 show in Calgary, AB, Canada on 10th July by the event website and local press. The outdoor show will take place at Fort Calgary in Calgary, AB. This is reportedly a private event for invited guests from the local business community. The line up also includes old tour mates Cheap Trick and an alternative rock band from Halifax, NS called Sloan. The band last played in Calgary in September 2007 during the Downstage Thrust tour. This takes the number of 2013 shows to 23 with 11 already played at VIVA Hysteria! in Las Vegas. "For all of Calgary's corporate mucky-mucks, the highlight of July is usually the Stampede Roundup party and concert at Fort Calgary. This year should be no exception as organizers have just announced the lineup for the July 10 show, which boasts British hard rock veterans Def Leppard as headliners. The band will also be joined by Cheap Trick and Sloan. Tickets for the private event, which is a benefit for The Rotary Club of Calgary (this year monies will fund the Pathways Project), go on sale May 6 to those 15,000 or so invited from the city's business community." 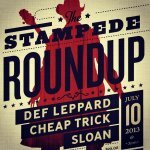 Stampede Roundup Artist Announcement: Def Leppard featuring Cheap Trick and Sloan Music! Bring on #Stampede!